Anna Ida Hinshaw1,2,3,4,5 [Ann Hinshaw6, Anne Hinshaw7,8, Ida Anne Hinshaw9,10,11,12]. 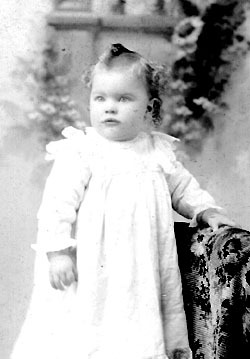 Born Nov 1 18951,5,10 [Oct - 18952,3,4,8,9], Klickitat County, Washington1,5,10. A double wedding of more than usual interest took place on the evening of July 7th, at the home of Mr. and Mrs. Alex Hamilton, in this city. The contracting parties were Walter T. Hamilton and Miss Anne Hinshaw; J.C. McCoy and Miss Elsie Pearson. Rev. Henry T. Greene officiated, using the Ting Service of the Methodist Episcopal Church. Shortly after the ceremony, the young people began their wedding trip driving by auto to White Salmon, where the wedding breakfast was served at the home of Mr. McCoy's mother. From White Salmon, they made the trip over the Highway to Portland, where they will visit for a few days. The young people are well and favorably known in Goldendale; and hosts of friends wish them all the possible good things of life, and a bright, happy future. Mr. and Mrs. Hamilton have lived in Goldendale and vicinity for many years. Mr. Hamilton conducts a confectionery store in this city. Mr. McCoy, prior to the first of the year, lived near White Salmon, where he is well known, while Mrs. McCoy has made her home in Goldendale for several years last past. Mr. McCoy is employed in the Sheriff's office as deputy. These young people are very popular with the "younger set," and the double wedding came as a surprise to their many friends. They have rented the residence belonging to Mrs. H.W. Burt, on lower Main Street, and will be at home to their friends after July 15th, 1917. Joan Hamilton, born c1924, Washington. Hamilton, Walter, head-of-household, age 24, born in Washington; father born in Texas; mother born in Oregon; owned home (mortgaged); occupation: farmer, general farm. Hamilton, Anna, wife, age 24, born in Washington; father born in Indiana; mother born in Oregon. Hamilton, Walter T., head-of-household, age 34, born in Washington; father born in Texas; mother born in Oregon; first married at age 21; rented home ($12.50 rent); radio in home; occupation: merchant, retail dry goods; World War I veteran. Hamilton, Ida A., wife, age 34, born in Washington; father born in Indiana; mother born in Oregon; first married at age 21; occupation: saleslady, dry goods store. Hamilton, Joan, daughter, age 6, born in Washington; parents born in Washington. 1900 census, Precinct 4, Klickitat County, Washington; roll T623-1746, ED 118, page 10A, line #13, dwelling #203, family #203. 1910 census, Goldendale, Klickitat County, Washington; roll T624-1656, ED 117, page 282A, line #32, dwelling #27, family #27. 1920 census, Centerville Precinct, Klickitat County, Washington; roll T625-1932, ED 90, page 2A, line #38, dwelling #33, family #33.
published 1982 by the Kickitat County Historical Society. Photo courtesy of Charles Barry Hinshaw. 1930 census, Waitsburg, Walla Walla County, Washington; roll T626-2523, ED 39, page 1A, line #6, dwelling #2, family #2. RootsWeb WorldConnect data by Vernon Goodrich (). RootsWeb WorldConnect data by Kathleen Wohlhieter (). 1900 census, Precinct 6, Klickitat County, Washington; roll T623-1746, ED 116, page 11B, line #7, dwelling #214, family #216.